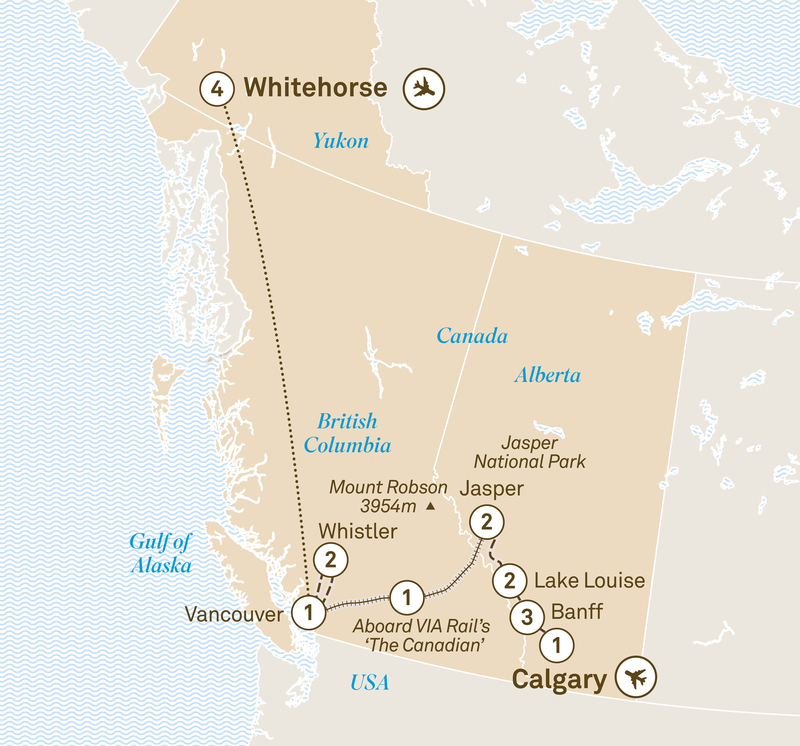 On this 17 day journey from Calgary to Whitehorse, discover Canada's winter wonders in 5-star luxury. Stay at the iconic Fairmont Chateau Lake Louise. Seeing the icy wonders of this extraordinary region has got to be one of the loveliest experiences. Dark winter nights to view the Northern Lights, icewalks through canyons outside Jasper and Banff and a journey deep into the iconic Yukon, this 17 day journey covers it all. Discover the beauty of Banff before the soul-cleansing serenity of Lake Louise. Jasper offers a myriad of activities to get you out into the great outdoors before you can sit back and relax on the great VIA Rail journey south. A quick stop in Vancouver lets you explore this cosmopolitan city before you head into the famed Yukon, where you’ll learn about its gold rush past, spot the fascinating wildlife and rug up at night to wait for the mighty Northern Lights. Begin your wondrous winter escape in Calgary, gateway to the Canadian Rockies, as you check into the Fairmont Palliser for your overnight stay. Tonight, meet your Tour Director and fellow travellers over a welcome dinner. Travel to Banff where your home-away-from-home resembles an enchanted castle in the forest. A mountain or valley view room for a three night Special Stay at the Fairmont Banff Springs is the best way to embrace your magical winter wonderland adventure ahead. Indulge your tastebuds with your choice of restaurant at your hotel. Winter splendour of the Canadian Rockies will astound you as you ascend to the top of Sulphur Mountain on the Banff Gondola. Get to meet a real Canadian Mountie. Continue your incredible Canadian winter experience with an icewalk into Grotto Canyon. See the mountaintops from above in a helicopter, take a dog sled ride or discover local landmarks and wildlife on a guided tour. Or stay cosy in your ‘Castle in the Rockies’ and rejuvenate in the mineral pools of the Willow Stream Spa. Fine or casual dining and a variety of restaurants to tempt your palate are on offer this evening. Retire to your lakeview room for your two night Special Stay at the Fairmont Chateau Lake Louise. Take a moment to relax overlooking the stunning frozen lake, perhaps venture out to marvel at the famous ice sculptures on Lake Louise or glide across it on ice skates if you’re game. Travel north along one of the most spectacular drives in the world, the Icefields Parkway. Marvel at the unique natural phenomenon of ice bubbles trapped below the surface of Abraham Lake. Explore this winter wonderland by helicopter, snowshoe and jingle to the bells of a horse-drawn sleigh. Arrive into Jasper and check into the Fairmont Jasper Park Lodge, where you’ll be ensconced in a junior suite for the next two nights. Canadian or Italian cuisine are among your choices for dinner tonight. Try something new, such as a Maligne Canyon icewalk, or put on your snow shoes and stroll with an experienced guide through the pristine Jasper National Park. Alternatively, learn about the friendly (and not so friendly) locals on a wildlife discovery tour. Enjoy free time at your lodge this morning. With 700 acres wrapped around pristine Lac Beauvert, exploring the grounds of the resort alone offers remarkable scenery and plenty of photo opportunities. This afternoon, board VIA Rail’s ‘The Canadian’ and discover the romance of rail as you sleep tonight in your private cabin. Arrive in Vancouver this morning after breakfast on board the train. Enjoy a city tour highlighting areas such as Stanley Park, Gastown and Canada Place. Later, head north to the winter playground of Whistler, a quaint alpine village nestled beneath Whistler and Blackcomb Mountains. On arrival, visit Squamish Lil’wat Cultural Centre where a First Nations ambassador treats you to a unique cultural experience. The wonder continues with a two night Special Stay at the exclusive Fairmont Chateau Whistler. There is a range of activities for you to choose from in Whistler. We have made a shortlist of options for you, ranging from exciting and adventurous to relaxing and slow-paced. Perhaps board the famous Peak 2 Peak Gondola, or take control on a snowmobile. Alternatively, if you’ve always dreamt of that magical winter experience of dogsledding through the snow, this is on offer too. Or perhaps you would just like to soak it all up, literally, with a visit to the Scandinave Spa. Enjoy your choice of restaurants for dinner in Whistler. Travel to Vancouver and enjoy a stroll around Capilano Suspension Bridge Park, which is even more mystical in winter. Enjoy time at leisure to explore cosmopolitan Vancouver before checking into the centrally located and exclusive Fairmont Hotel Vancouver overnight. Transfer to Vancouver Airport for your flight to Whitehorse, home to some of the best Northern Lights viewing in the world. Your local Yukon guide will meet your group at the airport and take you into town. Check into the Best Western Gold Rush Inn, ideally located on the main street of downtown Whitehorse, for a four night stay. Even the most acclimatised will be glad for the winter clothing arranged for this portion of the trip, including pants, jacket, boots, gloves and a beanie, or ‘tuque’ as the locals call them. We recommend resting up for the remainder of the day as it will be a late night tonight. Rug up inside a cosy, heated cabin at the Aurora viewing site, sip hot chocolate and treat yourself to late-night snacks while gazing out at the mystical Aurora Borealis dancing across the night sky. You will be assisted with your camera by a professional photographer to get the best photo opportunities of this incredible phenomenon. Discover the sights of the capital of the Yukon on a tour of the city. Late tonight, depart for another opportunity of Aurora viewing. Ponder over the scientific explanation behind this phenomenon, wonder at the magic of the vast universe from your cosy nook, or just relax and behold the spectacle occurring before you. Try a range of incredible winter activities today. Walk like the old-timers and trappers do, and you’ll see that snowshoeing is lots of fun – and hard work. The home of the Yukon Quest is the perfect place to ride with an experienced dog musher and enjoy the beautiful winter landscape from your dogsled, and you’ll also be driven on a snow machine along the groomed trail. Enjoy a third night of Aurora viewing. The viewing site is away from the city lights of Whitehorse, a dark, clear sky is your friend when viewing the Northern Lights. It is not always easy to see the Aurora, being a spectacular natural phenomenon, but you have a very good chance on this itinerary with four nights in the Yukon and the assistance of our local guide and expert. Travel to the Yukon Wildlife Preserve, where you can see wildlife in their natural habitat, including moose, caribou, lynx, bison to name a few. Moose actually outnumber humans in the Yukon (almost two to one), and here’s your chance to see the notoriously shy mammal up-close. Later, visit the Takhini Hot Springs for a relaxing dip in the warm pools. Enjoy an early farewell dinner, before venturing out for your last opportunity of viewing the resplendent Northern Lights tonight. (and photos to prove it). This luxury 18-day Rockies to the Coast & Alaskan Cruise begins in Calgary before travelling to Banff, Lake Louise & Jasper. End with a 7-night cruise.